The Great Western Railway (GWR) was a British railway company. It was founded in 1833 and became part of British railway at nationalisation in 1948. The factory dominated the town itself (Swindon), and the power of this employer in an almost totally one-factory town cannot be overstated. GWR was the main workshops of the world's finest railway. 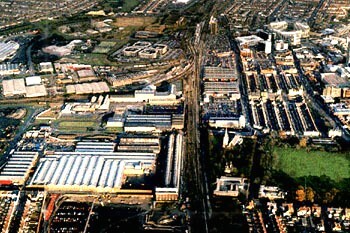 The Railway Works dominated everything for nearly 150 years. To-day the Great Western Railway system owns 9077 miles of single track.